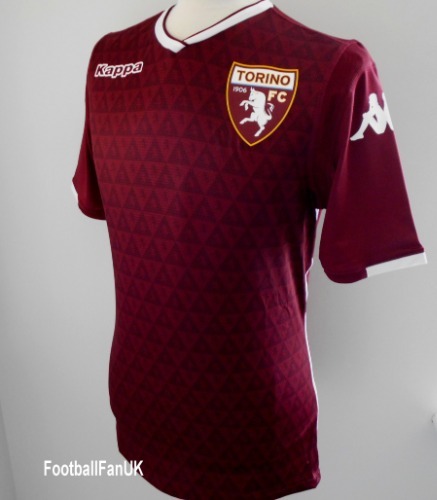 This is the official Kappa short sleeve home shirt, of Torino FC, for the 2018/19 Serie A season. Brand new with tags in Kappa packaging. Kombat, skin fit version, of the shirt (see measurements below). We are an official Kappa stockist. - Dark red with white trim. - Club logo graphic on front of the shirt. - 'Granata E Il Nostro Colore' printing at the back of the neck. - Kappa product code 3032G30. - Made from 91% polyester and 9% elastane for a figure hugging stretch fit. - New with tags in kappa packaging. - See our own stock photos of the actual shirt (size M shown in photo). - Adult Size Medium (UK-Small). Chest 39" Length 28". [skin fit]. - Adult Size Large (UK-Medium). Chest 41" Length 29". [skin fit]. - Adult Size XL (UK-Large). Chest 43" Length 30". [skin fit]. - Adult Size XXL (UK-XL). Chest 45" Length 30". [skin fit].